Each second about four million metric tons of matter is converted to energy within the Sun’s core. This gives the Sun a lifetime as a main sequence star of about 10 billion years with about 5 billion years to go. The surface temperature of the Sun is about 5780 K, which is equivalent to just under 10,000 F and 5,500 C. The temperature at the core is much hotter, close to 14 million Celsius degrees or 25 million degrees Fahrenheit. This extreme pressure and heat allow the Sun to generate its energy from nuclear fusion at its core, fusing hydrogen nuclei into helium. This nuclear fusion is self-regulating. 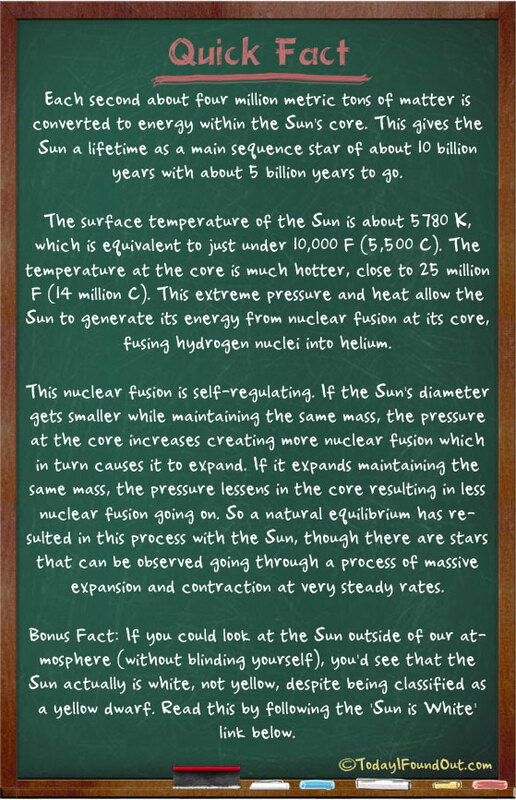 If the Sun’s diameter gets smaller while maintaining the same mass, the pressure at the core increases creating more nuclear fusion which in turn causes it to expand. If it expands maintaining the same mass, the pressure lessens in the core resulting in less nuclear fusion going on. So a natural equilibrium has resulted in this process with the Sun, though there are stars that can be observed going through a process of massive expansion and contraction at very steady rates. I say nonsense, not burning gas from Bang, but a electric portal custom made to provide light.